Incredibly, in the wake of a Jihadist beheading of a white, Christian grandmother in Moore, Oklahoma a few days ago, instead of coming forward with a statement condemning the barbaric act to Americans, Obama has sent a proxy messenger to the mosque of the murderer in Moore with a message of appreciation and support. Tell me how this can be viewed in any sane way other than condoning murder in the name of Allah? It is literally murderous sympathy for the devil and obeisance to blatant evil. David Myers, the Director of the Department of Homeland Security’s Center for Faith-based and Neighborhood Partnerships, spoke at the Islamic Society of Greater Oklahoma City for their festival celebrating the Muslim holiday of Eid al-Adha. He delivered a message from Obama thanking the mosque for their service in the wake of a tornado that hit the area last year. Apparently, all the negative attention the mosque has received since the attack warranted a personal visit from an Obama administration official to make sure that Muslims preaching an ideology of violence feel welcome in America. The mosque was the same one attended by the “20th hijacker” on 9/11. The mosque has ties to the Council on American-Islamic Relations (CAIR), a known Hamas front group. A man who attended the mosque confirmed that its teachings were consistent with radical Islam, including waging jihad against non-believers. The mosque had been under the direction of Imam Suhaib Webb, who has ties to former Al Qaeda leader al-Awlaki and now leads the mosque that had been attended by the Boston bombers. OKLAHOMA CITY – Oklahoma Muslims marked the end of the yearly pilgrimage to mecca with communal prayer and celebration called Eid Ul-Adha on Saturday. Leaders of the Islamic Society of Greater Oklahoma City say it’s been a tough month for Muslims here in Oklahoma after being associated with the beheading at Vaughan foods in Moore. But the Muslim community received the highest form of praise from the White House for their hard work in helping rebuild the Moore community after a destructive tornado tore through the city in 2013. Today, an official from Washington D.C. flew in to Oklahoma to present a special thank you to the Muslim congregation. He read a message from President Barrack Obama, extending warm greetings from the American people during the Muslim holiday. “Your service is a powerful example of the powerful roots of the Abrahamic faiths and how our communities can come together with shared peace with dignity and a sense of justice,” President Barack Obama said. An obvious act of terrorism on American soil in the heartland didn’t even merit a mention from the President of the United States. Instead he went to a fundraiser and golfing, while a 54 year-old woman who survived the Moore tornado outbreak, had her head sawed off. Then another woman was stabbed before the wayward Alton Nolen, a Muslim convert four years ago, was shot and sadly, not dispatched to hell where he belongs. Instead, it was labeled workplace violence as a woman’s body bled out and Obama lapped at the spilled infidel blood. Another Jihadist threatened a woman in the same city just a week or so before. Then an Arab man gained access to a school through an unlocked door, asking students and staff how many cops were on the premises and how far it was to a police station. They let him go — nothing to hold him on. Nothing to see here folks — nothing to worry over… Go back to sleep and leave the driving to Islam. 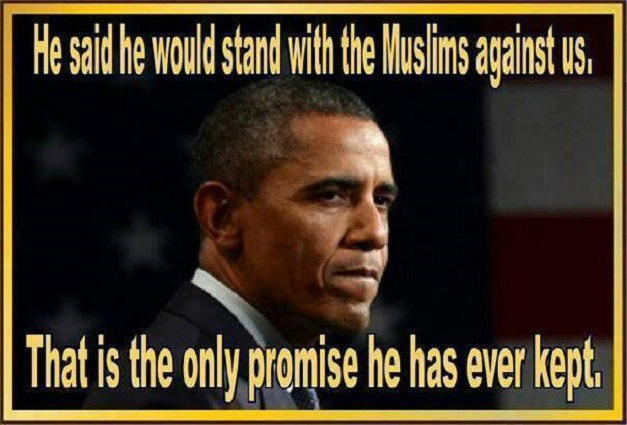 However, Obama comes running because Muslims feel threatened. They are claiming it’s been a tough month since the attack. Sensing a pattern yet? It was probably tough for the dead woman too, but she couldn’t tell us — she lost her head and her life. I don’t blame people for being pissed at the Islamic community over this. There were no real apology for this atrocity. In fact, the mosque and Imams defended it. Tell you asshats what… you want a piece of us? Bring it — we’ll give a piece, while taking three. No one was sent to that Christian woman’s family to comfort them. You let the innocent die horridly and then comfort the murdering jackass and his buds? You couldn’t send a clearer message of your allegiances if you threw it up in neon lights over Vegas. It is unfrickin’ believable that the nation sits here and takes this crap silently and shrugs. If it does not affect you now, trust me… it will. When the Religion of Pieces comes for you, what will you do then? Change the channel? Pray? Plead for your life or your family’s? Hope the President says and does something? Don’t hold your breath. He’s made it clear what side he is on and it faces bloody Mecca. We should all pray for the families and those struck down in Moore. Pray for all of America as she wakes up to the fact that she is at war with radical Islam. Meanwhile, our President, the Progressives and the media will condone murder in the name of another God. Today I had the most weirdest conversation that pierce my heart when I had with my family where they thought Conservative were idiots to believe the truth about Socialist, Communist, Fascist and Anarchist.